Hibs will face either Ayr United or Alloa Athletic away in the fourth round of the William Hill Scottish Cup on the weekend of 29 November. Head Coach Alan Stubbs told the club website that the squad will be prepared for the match, although admits he would’ve preferred a home tie. Stubbs said: “It’s going to be a tough game for us, whether we face Ayr or Alloa in the next round of the Scottish Cup. “The opposition will present us with different challenges, but we’ll make sure we’re ready for it on the day. 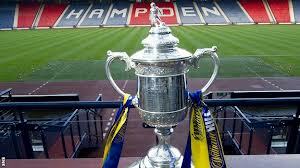 The draw took place at Hampden earlier today. Ayr and Alloa drew 1-1 at Somerset Park on Saturday with the replay set to be staged at Recreation Park on Tuesday 11 November and the winner will face Hibs. Ticket information for this Cup tie will be confirmed in due course. The last time Hibs travelled to Somerset Park in the Scottish Cup was in March 2012 when a header from Roy O’Donovan followed by a Leigh Griffiths’ penalty ensured the club progressed to the semi-finals. Hibs last faced Alloa away in a Scottish Cup tie 77 years ago in February 1937 when Willie McCartney’s side recorded an emphatic 5-2 win.